This new tool for “real” pets is another example of handheld electronics similar those used in handheld games passing over to actual pet applications. The Hear Now company of Calgary, Alberta, Canada launched the “Hear Now” in 2006. 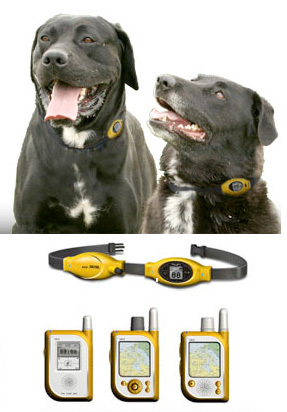 It allows interactive two way voice communication with your pet at a range up to 12 miles. Some versions also include LED lights for night time visibility, GPS tracking technology, and a PEPi Recorder (Personal Entry Pet Information) allowing owners to record their contact information which can be played back if the pet is found. A handheld controller allows communication with the pet and GPS tracking on maps on versions with that feature. Military and Police applications are strongly featured on their web site. Officers can follow police dog position on a map and hear what is going on around them. The system has GEO fencing capabilities (your dog boundaries can be defined on a map) and is also available with a horse collar attachment. One feature is telling your dog to stop barking without yelling at them from a distance. You can just talk to them. One hand controller can control up to 14 different pets. We find it interesting the way electronics are working their way back over to actual pet applications.